Theodoros Vardinogiannis Stadium is a multi-purpose sports arena located in Heraklion on the Greek Island of Crete. Home to local team OFI Crete since opening in 1951, the 8,500 capacity ground is commonly known by its nickname of Yedi Kule (Seven Towers) and was most recently renovated in 2004. Written history of Theodoros Vardinogiannis to be added in due course. If any Greek Football Trippers happen to have a stadium map or seating plan of Theodoros Vardinogiannis Stadium which we can use then please get in touch via the contact page! Theodoros Vardinogiannis Stadium is comprised of four stands: North, East, South and West. Likewise with the seating plan if anyone reading this happens to know where they’re located then please do get in touch. There’s nothing on the official website which suggests that there is an OFI Crete fan shop located at the ground although you should still be able to pick-up some souvenirs from various stalls on matchdays. We’re 99.99% sure that there are no publicly available tours of Theodoros Vardinogiannis Stadium and we doubt there ever will be. Individual tickets to see OFI Crete can only be purchased from the stadium as there are no online sales at this moment in time. The various ticket booths around the ground open for around 90 minutes before kick-off, and require you to bring ID. 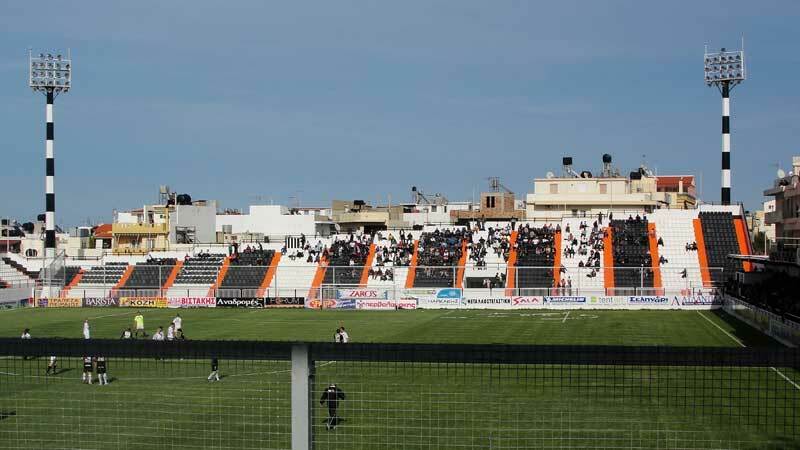 OFI Crete’s stadium is located less than 3.5 km from the heart of Heraklion with the journey by foot likely to take the average Football Tripper the best part of 40 minutes. One of the entrance into fanzone within the main stand at Theodoros Vardinogiannis Stadium. Situated within a dense neighbourhood you sadly won’t find any parking spaces at the ground so be prepared to drive around for a bit and potentially have to walk. Heraklion isn’t blessed with its own train station as there’s simply no point due to the lack if railway infrastructure across the mountainous island of Crete. Heraklion International Airport can be found only 5 km east of the city centre which is very convenient for any Football Trippers looking to see OFI Crete play at home. There are far too many potential accommodation options between OFI Crete’s stadium and Heraklion city centre to mention here. You can pretty much walk anywhere along the coastline between these two points and stumble across well priced hotels which are a minimum of three stars.